If you don’t like Equity because you have a lesser risk appetite and still you want to make better returns , where do you invest ? 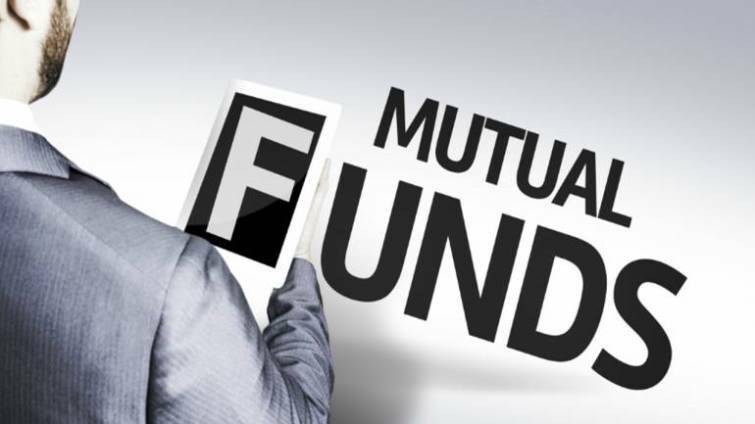 The answer is Debt Oriented Mutual funds , In this article we will see What are Debt Oriented Mutual funds , A list of Good mutual funds and what are the returns you should expect from them . 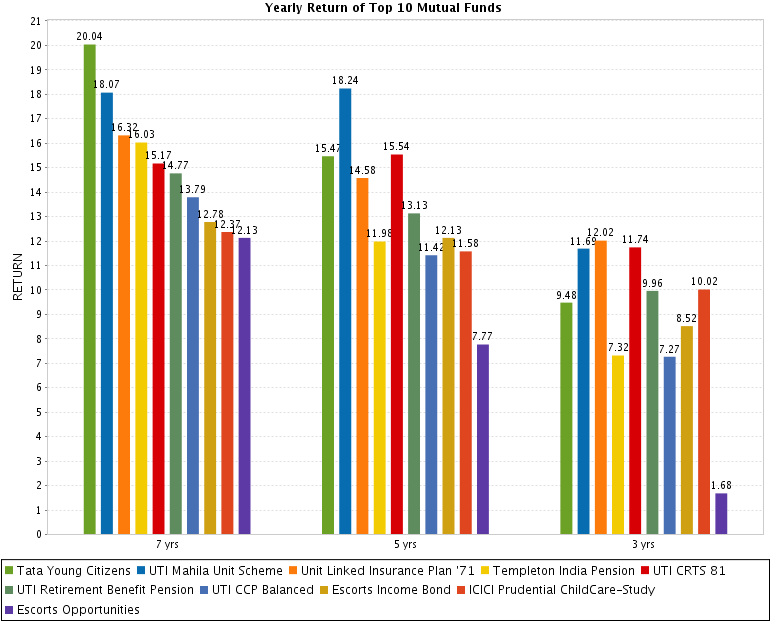 Have a look at List of Best Equity Diversified Mutual Funds. These funds are getting very popular these days as people are not ready to put their money in market for long term because of Market Uncertainty and decreased risk appetite after the recent fall in 2008-2009 . What are Debt Oriented Mutual Funds ? Debt Oriented Mutual Funds are those Mutual funds which Invest primarily in Debt products like Debentures , Certificates of deposits from Corporates , Govt Bonds etc , They put a small portion in Equity also (10-40% max) . These funds generally return in range of 10-20% in long term and the downside is limited in these Mutual funds as Debt Component is High. Let us see some Stats which will give you more idea about these . In 7 yr time frame Best return is 20%and worst return is 8.09% . In 3 yr time frame Best return is 12.09% and Worst return is -5.87% . 5 funds are more than 10 yrs old . Most of the Funds do not have an Entry load, but can have exit loads if exited before 2-3 yrs . Some have locking period also , but no tax benefit . 16%+ return Since Launch, 8 yrs old Fund , Excellent Track Record . Equity Component is very high at 50% . So I am not sure if this will suit as Debt Oriented Fund .. only people with strong heart should take this . One of the Best Funds , 28 yrs old fund , Lambi Race ka Ghoda , 13%+ return CAGR which is amazing for any debt oriented fund . Equity Exposure of less than 30% and the worst return ever in 1 time period is -14% , the best is 35-40% in a year . Looks great for Future performance . Note : please make sure you read all the other details yourself before you decide on buying , These are just my personal opinion and make sure you are your own decision maker 😉 . Last year when markets were doing bad , Debt Funds were the best choice of the Investors , However Its not the best time to Invest in pure Debt Funds , but rather invest in Debt Oriented Funds if you are not ready to take high risk. Look at the following Video which Is not a recent one, but talks about How investors were eager to invest in Debt Funds Last year . If you don’t have very high Risk Appetite , you can look for alternatives to Debt Oriented Mutual Funds , Its always better to park your funds with these if you want more than 10% return with some amount of Risk . Please note that These are not equity Diversified funds and hence you should not expect very high returns from these .. If you get around 10-12% from these funds that is more than good . Anything more is wonderful . Please share your comments. Do you think you will invest in these funds, Are the returns from these Mutual funds are worth looking at them? Any do you know of any other fund which is not covered here? Please leave your comments. I want to invest lampsum amt 8 – 10 lakhs in flexi stp debt fund . After 15 years 2 daughters marriage & my son edn. I want return corpus 1 crore . So plz suggest good stp debt fund otherwise suggest a good way . Plz give information types stp debt funds . Im new in mutual fund and shares . ICICI MIP 25 is a good debt fund if you want to beat FD by taking a very small risk ! Sir I am 22 yes old..I dnt have any knowledge about investments,I went around all Blogs & other sites.I concluded that all the FD ,MIP etc range form 8-12% of growth..
My question is If i invest 50000 Per month what are the methods from which i can get assured returns in range of 3000 -5000 Rs monthly. Think I have 20 thousand for savings per month after all expenditures. 1).I am investing Rs 1 lac in PPF every year.I started it 2 years back.though it will be useful for children education after 15 years.I want whether is it good option or not keeping inflation in mind? 2).I want to take Debt Funds and Gold ETF to beat the inflation .So please suggest me some good funds and how much i have to invest to get 4lacs/5 lacs every 4 years or 5 years like. i invested 1.25 lacs in ulip , icic pru life time super , now the fund value is 85000/- should i continue?? Better you dont . Surrender now ! thanks sir, but will you advice me which one will be a good one for me. i CAN INVEST 10k PER MONTH . Risk – 50 % i can take. Invest 5k in equity mutual funds and rest in a RD ! I want to invest in debt fund approx 60,000 and i want to start SIP monthly in equity with Debt fund . Please suggest how is the plan. Also suggest best debt fund and best equity fund to invest. It would be STP from debt fund to equity fund , how good it is , can be only said if your objective is clear, what do you want to achieve ? I want to invest upto 5lac in mutual fund, which one is better for me as i am totally new about MF.which MF will gives me more intrest with security upto 2-3 years period of time ,as i am getting 8% from bank by FD. pleas suggest some good MF names which gives good intrest with security..
Pls. suggest for 1year time and also i am looking for the high liquidity option too. This is a good article. Do you have any analysis or article done on which funds are good to use as an emergency fund parking place? Money which I may need after 3 months or 5 years, but is just parked there better than a bank FD for more than about 8% return. You can then look at debt oriented funds only ,otherwise there is no way to get better than FD returns with liquidity as good as liquid funds. Are returns in Debt funds taxable on maturity? If yes then whats the rule? Yes they are taxable . for any gain within one year, its added to your salary and taxed . could u please suggest me the portfolio ofbest mutual funds for the coming year, my risk appetite is moderate, planning to do SIP…. thanks manish. What are the Debt Funds you are going to invest you personal money. Please suggest me i have at present 14 lacs in my hand and iam a private employee with a lot of job risk. Yes , SIP is a concept for mutual funds and not about equity or debt. however there can be some funds which might not allow SIP , also SIP in debt funds does not make much sense , as SIP is a concept which is used to capture volatility . I want to invest Rs.500 p.m. Debt oriented SIP, Which one the best and safest ? You should be able to find this information on blog itself , have a look at the “how to use this blog” video in the sidebar . Regarding MIP. I dont need monthly income at this time but can I invest in it’s Growth option so that I can get pension like income after 10 to 15 years? You can invest in growth option , and once you require monthly income , you can shift to dividend options . Note that MIP does not neccessarily give monthly income , it can be quarterly or half yearly also . Your articles are spreading awareness on the investments, something which is really needed in India. I am looking for a short-term investment plan, something which could give me considerable returns in just 6 months. Could you suggest few good MFs? Do you think I should diversify my investments in FD and Debt MFs? Considering US Senate bill on more trading restriction, equity does not seem a good option for short-term plan. Whats your view? I am assuming that you are in US . Though I dont have much idea about US markets , however the basic fundamentals remain same, 6 months is not a time frame you should look at returns, you can only target safety of capital . So better go with FD’s or debt oriented products , make sure they dont have lock in periods. Canara Robeco Income-G is one of the best debt funds, it definitely deserve place in your list. Are there any pure debt funds that invests totally in debts? Is investing 70% in equity MF & 30% in pure debt funds a good long term strategy? 70:30 is not a heavenly formula , you have to decide what ratio is good for you . its can be 100:0 also or 50:50 , we decide this ratio to do portfolio rebalancing every year . manish i don’t exactly know the meaning of MIP schemes..
1)/ suppose if i invest 20,000 rs in lumpsum in MIP then is there any difference in investing in it or doing in another debt fund..
i don’t need any regular income..
suppose i need to kp investing in it for 1 yr..
MIP are monthly income plans which provide monthly incomes , so if you dont need regular income then you dont need to invest in MIP . how about the HDFC Monthly income scheme debt fund, and reliance MIP…they are the top two schemes in debt category? is there any difference in MIP schemes and other debt schemes?. MIP are monthly income plans , so if you need monhtly income , you invest in MIP . Lumpsum investment in Debt fund or SIP , whatever , there is no volatility in debt funds return , so anything is ok .
you comments and posts are very good and helpful. you actually explain financial concepts in very simple terms. I want to know that generally to invest in debt funds what is good time. Like how in share market when prices are low its best time to invest similarly what is best time to invest in debt funds i.e. when interest rates are low like now or when interest prices are high like what interest rates were couple of years ago. Generally Debt funds should be used for short term , and therefore it does not matter a lot to time them because the returns are mostly secured . For long term we should use equity as the main tool . What are the funds you are looking at ? It is a classic sectoral fund . The sector is infrastrutcure top 3 sectors holding more than 60% , which makes its performance dependent on those sectors 🙂 , but that fine because its suppose to have high share in few sectors . The fund is very risky as you can see its bad performance was in 1 yr , 6 month and 3 month , Are you ok if in future your money is down 50% in 6 months ? So what if it has returned 112% in 1 yrs . I am looking to invest in one balanced fund. Out of HDFC Prudence, Reliance Regular Savings Balanced and DSPBR Balanced , wihch one do you suggest ? Yes.. I Can diversify.. and even i like HDFC Prudence .. The only thing is that i already have 2 elss funds and one diversified fund HDFC Top 200.. just thinking how prudent it will be to have another fund of the same AMC. btw, Can you throw some light on how we redeem the debt funds ? is it just like normal equity funds where we can redeem as per our wish or do we have wait for any maturity period or something like that.. Nothing wrong for going with fund with same AMC , each mutual funds has its own Fund manager and its own guidelines for investing . Redeeming debt fund is same as Equity funds . Gerenally debt funds can be redeemed anytime you want , but make sure you look for this lock in thing for your fund , may be it has it for 6 months or a year . and with online facilites , you can buy and sell anytime you want . Interesting.. This seems to be modeled after recent trend in US Banking. Like ing direct in US which is famous. It works good. Normally we will have to open a web only account which can be linked to any of your current savings bank accounts. No check books/bank visits. Just transfer funds between web and your bank a/c’s, whenever u need to encash. advantage is high interest rate offered as bank need not maintain branches and cheques etc. It is like parasite living on other bank a/c’s. Any experiences with this icici branch free accts? I have some LTCG on maturity of Debt fund. Can I invest the LTCG component in REC bonds (54 EC) to avoid paying the tax on LTCG? Yes . However , You have to consider other things .. I am using a Auto sweep account for FD , and it should be redeemed with in a day (at-least thats what the bank told) . Do you suggest one should keep around a lakh in bank and keep other debt saving in Debt Fund . btw have you come across the Branch Free Banking account of ICICI , they give interest of 7-8% on normal saving account . I am sure you Auto sweep account would give you money in one day . So its liquid, but return wise its bad . You dont need to put 1 lakh in Bank saving account , You need to keep around 2 months expenses in Cash (accessible through ATM) and another 3-4 months expenses in liquid Funds (not debt fund) . I have no idea about Branch free account , Please tell more about it . Looks interesting. hehe . I am watching you closely 🙂 . So the thing is bank FD are actually Liquid , you think like this because you can break it anytime and in some days money will be in your account . this works !! . But if you break it , there are two things . 1. Your interest part is almost gone … If you were getting 8% , now you will get just 2-% . Check this .. I am not accurate . 2. The time it takes for non-online account can be more than 1-2 days . So Emergency fund is not for earning , its just for using when you need it . In todays world you have access to 50l or 1 lac through Friends and Family , but just take care of worst cases . So you suggesting to park emergency funds in a liquid fund, i guess? Can you suggest some of such good funds..
Also, what’s the difference between a liquid fund and a MIP plan fund, which are mostly deb-oriented ? Aren’t both of them debt oreiented only?? Liquid funds park money in short term instruments which mature in short period . we invest in them for liquidity not for growth of money . MIP on the other hand invest in mix of debt product and their aim is to provide monthly incomes consistently . See valueresearchonline for suggestions . A timely article Manish , I was considering investment in debt fund for some time . I have some emergency fund (Around 6 month of my monthly expense ) which is in Bank FD . Does it make more sense to keep them in Debt Funds or the emergency reserve is better left in Bank? assuming that the int rates have bottomed out and are due to rise. I have 1-2 yrs view expecting int rates to rise. which one is better hdfc floating rate income mf or birla sunlife floating rate mf. oops .. I have no much idea about those .. Not sure about 1 yr time frame either ..
Well you can look at my article on List of Equity funds , also you can choose some Balanced fund from valueresearchonline.com , Some good are HDFC Prudence , SBI balanced , DSP Balances etc . I want to invest in mutual funds thru SIP. My age is 26 and can invest Rs 2000 per month. I am looking for Balanced diversified, or Equity oriented funds. Sorry Manish, I meant why are these 3 funds Not included in your list? Well.. these are good Funds .. No Doubt . the only thing is they are MIP’s , They are not in the category of Debt Oriented Funds … When we say Debt Oriented Funds .. it means they are just Debt Oriented , but still have close to 15-40% in Equity ..
MIP’s are generally very less in Equity like 5-10% .. Thats very close to Pure Debt funds ..
the element of Return Potential in MIP is on an average less that Debt Oriented Mutual Funds . why are Birla MIP II Savings 5, HDFC MIP LONg term , and Reliance Mip included in your list ? Do have a blog on short term money management? Like parking cash in liquid funds? Is there a liquid fund review you have? After i read this, i went to my MF advisor and asked him to start my SIP in the UTI fund. He looked surprised and said that SIPs are only for equity funds, and people rarely put SIP for a debt scheme. I was confused – is this true? is it that debt funds are not good for SIP? Your MF advisor needs Education .. SIP is just a method of Investment . SIP will be allowed in a Fund or not , Its a decision taken by Mutual funds . Its never a General rule . So there can be Debt Funds or even Equity Funds which Do not allow SIP investment . Here is list of some funds which come into Debt Category , but allow SIP . Change your Advisor .. Get some one from Our Network . Thanks for The idea . you guys power this blog !! .. Awesome !! Sweet! Thanks for turning my suggestion into an awesome blog.. I appreciate it..
.-= Taranfx´s last blog ..What is Windows Azure =-.